Sometimes the music of the past still makes a difference today. And with that in mind, a while back we at Jupiter Index asked a number of diverse artists what musical releases had either most influenced them or which they simply enjoyed hearing. These are their replies. 1. 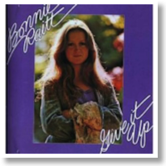 Bonnie Raitt - Give It Up or Takin' My Time - don't make me choose. 2. Rolling Stones - Exile on Main Street or Sticky Fingers don't make me choose! 3. Delaney and Bonnie - Motel Shot. I'll try my best. These albums aren't necessarily my absolute favorite five, but they're ones that I remember having an impact on me. brought me together with like-minded people from different backgrounds. Lubbock, I'd never heard anything like it. I was so full of anger at that time in my life. This album was like God had answered my silent question: Why does music have to always be so shiny and pretty when life isn't? I'd listen to it non-stop all night and day and wore out several cassettes of it. insane. This album made me realize how interwoven beauty, insanity and bitterness are. Despite the fact that it's one of those albums that's generally overplayed (especially certain songs), it still inspires many of the same feelings I had then. that woke a certain part of me and made me feel I'd certainly heard echoes of it in a past life. I think Shane Magowan will be regarded as a genius when he's gone. me at the time. I feel at times that if I was only allowed to listen to one album for the rest of my life, that would be it.